With the plethora of pianists around today it’s unlikely that Sung-Suk Kang will be a name on the tip of the tongue, especially as an exponent of an all-Mozart programme. The comprehensive biography informs the listener that Kang was born in Seoul, South Korea, and began her formal training at the age of five. After a further period of study in Singapore as a teenager, she came to the UK to continue her musical education at Manchester’s Royal Northern College of Music. Winning first prize in the Schumann competition in Italy, she completed her studies in Paris, before moving to Vienna. 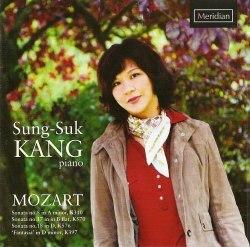 Kang has already recorded for Meridian, where her discs of Chopin and Schumann have been well received. Kang’s biography rather gives a clue as to what you might expect to hear on the present CD. In terms of repertoire she has chosen two of Mozart’s ‘performer’ Sonatas - in A minor, and D major, respectively. These always figured on piano-diploma repertoire lists, given that they probably make greater technical demands on the player than some of the others. Furthermore the A minor, and the frequently-encountered Fantasia in D minor do provide opportunities for a more ‘Romantic’ treatment, something with which a player of Chopin and Schumann may well empathise. The remaining Sonata in B flat, K570 is a popular work, and helps contribute to a varied selection. Kang’s playing is most articulate. Dynamic shadings are well observed, tempi are appropriate and, most importantly, while the interpretation is never devoid of a sense of individualism, it never oversteps that boundary which is so crucial in the works of Mozart - not earth-shattering, but equally not mundane either. Meridian designates the CD ‘A Natural Sound Recording’. While this is comforting to read, one would hope that all recordings had this objective in mind. The piano is not identified and with judiciously-placed microphones, it would be difficult to decide whether this is a full-length concert grand, and not ideally suited to the material, or, perhaps, an instrument of boudoir size. From the sonority of the bass notes alone, the latter would seem to be more likely. But what can seem a tad intrusive at times is just an occasional slight whoosh, as the sustaining pedal is released, and the dampers fall back in place against the strings. Meridian does not use any post-production processing in its appropriately-named Natural Sound recordings, such as the present CD, a practice employed for well over thirty years now. In the opening Sonata, the trills tend to start on the note itself, rather than on the note above, which was contemporary practice. This does somewhat scale-down the harmonic tension particularly at cadences, or ‘ending points’. In the work’s Presto Finale, however, Kang finely manages the key change to the major, with a slight degree of ‘liberty-taking’, but one which comes off, and is not felt as self-conscious. Kang successfully resists the urge to over-cook the Fantasia, and makes the best of Mozart’s rather banal closing bars - which history now ascribes almost certainly to some lesser mortal. The Sonata in B flat is distinguished by a well-pointed Finale, where Kang’s ability to balance the hands appropriately is very much to the fore, and is used to good effect. This is also especially well-managed in the final work, where the contrapuntal writing in the opening Allegro is especially effective, and also in the Rondo Finale. This is taken quite briskly for its Allegretto marking, but definitely comes off in performance, contrasting nicely with the movement’s decidedly understated conclusion. Sleeve-notes are comprehensive, even if the amount of information provided does make for the use of quite a small font and no paragraphs. The emboldened of titles for each piece does offer some assistance, at least in quickly homing in on each item. Perhaps a slightly more thorough spot of proof-checking, though, might have corrected the title Fantasie D minor - a mix of German and English - and the absent ‘K’ in the final work’s Köchel catalogue number. All in all, then, a satisfying CD which does what it says on the tin, but which artistically sits between two stools. There are equally good recordings of these works available, by similarly little-known artists, and which are somewhat cheaper. Alternatively pay more and get trusted interpretations from respected and perhaps more eminent Mozart exponents.